JODY E. WILLIAMS (left) at the utility box-turned mural at Lampson Avenue and Lamplighter Street in West Garden Grove. At right is daughter Samantha Seguine, 13 (Tribune photo). 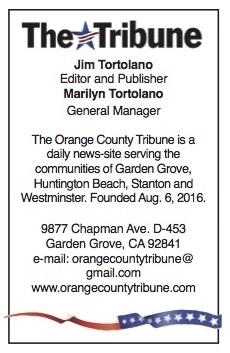 Indeed it was Jody E. Williams, 54, of Garden Grove, who did that, and there’s a bunch of them hanging out at Lampson Avenue and Lamplighter street in West Garden Grove. 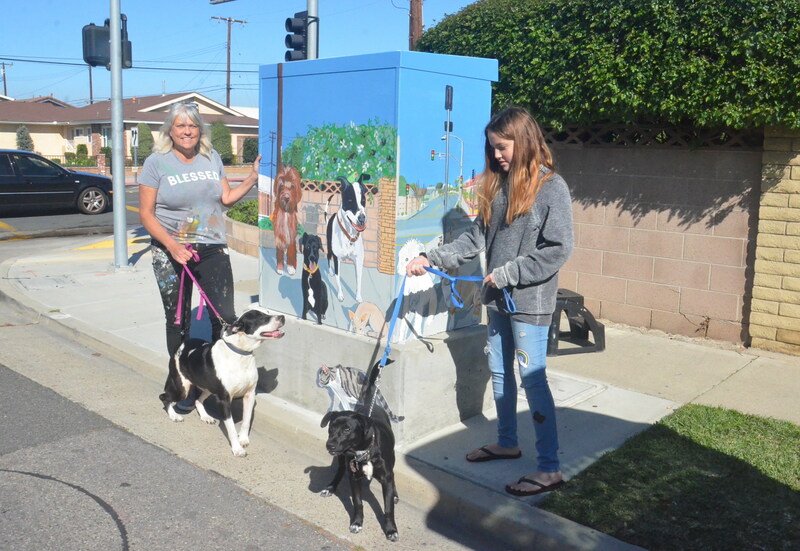 Well, they’re not actual dogs, but rather a mural of local canines painted on a utility box, a piece of art that’s attracted a lot of attention and admiration from the folks in the area. “I just got tired of looking at the plain white box in our neighborhood,” she said. With the permission of the city and the utility company, she got out her paints and brushes and went to work. Williams is a professional muralist. A 30-year resident of Orange County, she’s been in Garden Grove for four years and has a business – Art4shore.com – that does wall murals, art on windows, holiday windows and face-painting. That four-legged tribute was done as a donation to the area, but people have approached her and – unsolicited – handed her money. And it if you’re not a dog-lover, she’s not partisan. She’s painting some felines along the bottom of the box. But as you know, it always takes more time to herd cats. Between Robin’s mosaic masterpieces and your lovely murals, thank you beautifying our neighborhood. That is so awesone, Jody!